Well, GvG is almost here. In fact, it’s live on Arena right now, which is amazing for people who just want to Arena with the cards, but for me it’s just a huge tease. I want to OWN the cards, and more importantly, crush people in Constructed with them! With 120 new cards and countless other full set reviews out there, I’m just going to talk a little bit about the cards I’m personally excited about instead of just the most powerful cards that everyone has already gushed over endlessly. 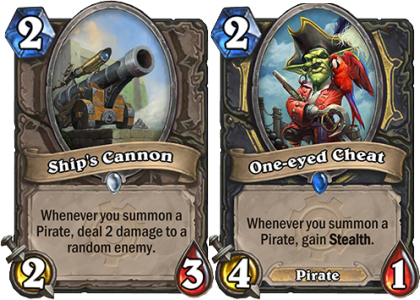 I don’t think Hearthstone is quite ready for a full-on Pirates deck that can take people to Legend – it still needs like ONE great pirate and one OK one to bring everything together. However, One-Eyed Cheat is a pretty nifty number you could play on three along with a Southsea Deckhand (ha-HA!) to get a free four points in. Now, having another reasonable pirate to follow up with is the issue, and no, Southsea Captain is not reasonable. Not yet anyway. Now, should another worthy pirate appear, Ship’s Cannon could see a little play. I really wish it was a 3/2, but being able to play it on three and a one drop to kill an opponent’s one or two drop seems enticing. Sadly, both of these cards are super weak against Haunted Creeper, which sees far more play than it should. I have been fascinated with spell damage since I started playing Hearthstone way back in closed beta. The keyword is clearly something the developers feel could spiral out of control very quickly, and so they only put it on a select few minions, and poorly-costed ones at that. I agree with them in part. Spell damage is powerful, but the restriction that spell damage can only occur on minions(because they are the only permanents) meant that it was always a fleeing thing, something you used to get an extra boost for a turn before the creature was traded off. Often, spell damage minions are expensive, like Azure Drake, or fragile, like Bloodmage Thalnos. Mini-Mage can help change the narrative a bit. It’s versatile since it can be used like a removal spell, well costed given the abilities and designed purpose, and is neutral so it can fit into any deck. Mini-Mage can be looked at in some matchups as a four mana spell that permanently increases your spell damage by one. Others, it can get in there after providing the traditional one turn boost. Personally, I think it lends itself fantastically to a Shaman burst deck since Shaman generally don’t have much to do on turn four other than play a removal spell and totem up, or cast Spirit Wolves, mostly because they can’t be sure that the Lightning Storm in their hand will clear the board. Mini-Mage makes things a bit more certain, something Shaman decks clearly want. 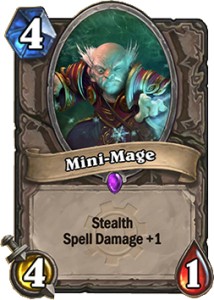 Mini-Mage fits just as well into any deck relying on spells that deal damage to get the job done. It could mean the revitalization of Mage or Rogue Malygos-centric decks since they won’t have to lean so hard on drawing Azure Drake and Bloodmage Thalnos in the mid-game. I may be way off base on this one, but I feel this card actually isn’t bad. Sure, it looks alot like Far Sight, a card that most people don’t play and generally isn’t very good. 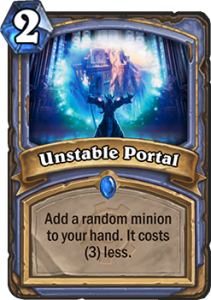 There are two huge differences between the spells, the first being that Unstable Portal is a Mage card, not a Shaman card. Both classes like to control the board, but while Shaman can’t really afford to fall behind to a large creature because they only have two Hexes at most, Mage has more reliable and powerful sweepers and two ways to deal with a singular large threat in Fireball and Polymorph. This can heavily mitigate the cost of taking a turn off to cast this early and getting something you cannot cast. The other advantage is more subtle, but is a powerful factor in many games of Hearthstone. We’ve all been Thoughtstolen by Priests in the past, so we understand the effect this can have on the game. Assuming we aren’t also playing Priest, we suddenly have so many more cards to consider when finding a line of play. Hmm, what if he got my Brawl, or my Gorehowl, or even just an Inner Rage? Playing around a bunch of extra potential cards can be tough. Now imagine your opponent casts Unstable Portal and doesn’t cast the minion he got immediately. The number of potential minions they could have is staggering, and nearly impossible to play around completely. The second point is, of course, offset by the fact that some of the time, you’re going to get a bad minion. But pretty much every large minion will be good, and there are far more good minions to snag than bad ones, and the bad ones you can almost always just play in the same turn since they likely cost zero! I can’t stress enough just how excited I am about Crackle. Sure, it has the worst type of RNG, that is, RNG you have to adapt to after the fact rather than having the ability to deduce from playing the game (secrets, spare parts, etc.). But consider Crackle’s role in an aggressive Shaman deck. For two mana, it can trade evenly with many minions, and has the ability, especially when bolstered by Wrath of Air, to take down five or six cost minions for only two mana. 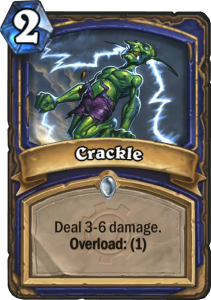 Crackle also fits well in an aggressive Shaman deck that wants to burn opponents out. Compare it to Lava Burst. Crackle’s average damage is 4.5, only half a point less than Lava Burst. Burst, however, costs more mana AND has Overload two to Crackle’s one. That’s not to say that a deck with Lightning Bolt, Lava Burst, and Crackle can’t work. That’s 22-28 points of burn over six cards, not counting potential spell power from Wrath of Air or other effects. 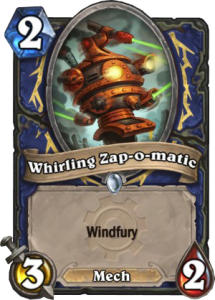 Another new Shaman card with an aggressive bent, Zap-o-matic can severely punish players for missing drops, or for casting stuff like Wild Growth. If you get the WZOM(?) down first before your opponent’s two drop, you even get a free three damage in before deciding whether to trade or not. Imagine this scenario. You’re on the draw, and you coin out WZOP, and your opponent plays his own minion. An Abusive Sergeant and a Lightning Bolt later and you’re way in the lead. What about just going ham and casting two Rockbiter Weapons? Sure, you’re down a bunch of cards, but you just cast a couple one mana Fireballs, and a deck designed to take advantage of a crippled opponent could likely find enough burn or charge minions in a few turns. I just want to point out that the untapped design space in Hearthstone is somewhat staggering. We’ve seen a few departures from the limited by practicality physical world of CCGs with mechanics like Mad Bomber, Mind Vision, Nozdormu, and the very concept of the Arena. But GvG is taking another step into uncharted territory with cards like Unstable Portal and Bolvar Fordragon. Just imagine where we’ll be in a few years. Personally, I’m hoping for cards that grant hidden effects that you can access just because they are in your deck, sort of like Panglacial Wurm in Magic. It doesn’t have to be as simple as that though. It could be something like a minion that you would never want to draw because it has an overcosted mana cost, but you get to play for free when a condition is met, for example, when the third Silver Hand Recruit of yours dies. Or perhaps it’s a terrible card you include in your deck to gain access to a single-use pump spell you activate by clicking elsewhere. The possibilities are near limitless!